1. 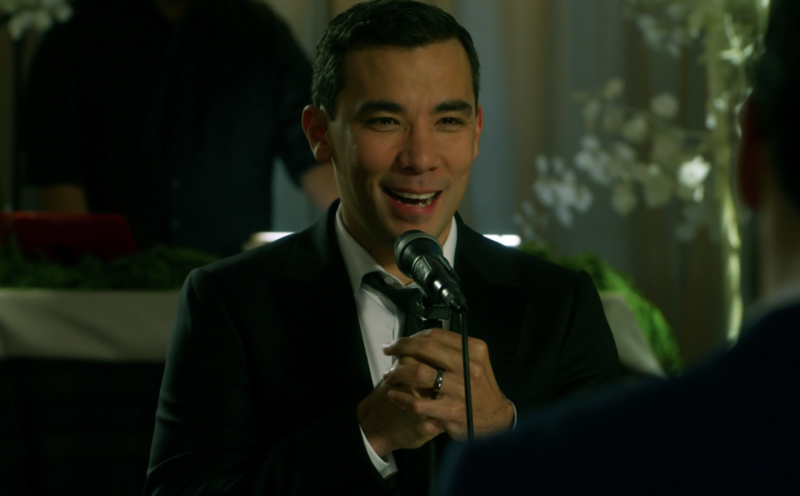 First, in Schitt's Creek, Patrick serenaded David with Tina Turner's "Simply the Best" at an open mic night, and I can't think about it without crying. 2. In Brooklyn Nine-Nine, Jake and Amy got married in a perfect ceremony outside the Nine-Nine. 3. In Grey's Anatomy, Jo and Alex got married in perfect Grey's fashion: on a ferryboat with Meredith as the officiant. 4. Oliver finally fought his way out of prison in order to be reunited with Felicity, after they had spent the beginning of Arrow Season 7 apart. 5. In Riverdale, Cheryl and Toni finally got together after Toni and Veronica mounted a rescue to save Cheryl from the Sisters of Quiet Mercy. 6. In The Good Place, Chidi and Eleanor kissed while inside Janet's void and it was perfect to say the least. 7. In Shadowhunters, Magnus promised that he would make it back to Alec, no matter the cost. 8. In This Is Us, Randall told Beth that her voice was his favorite sound in the world. 9. And in This Is Us, Rebecca realized that Jack was the one when they were simply doing dishes. 10. In The Flash, Barry slowed down time just to have an extra moment with Iris before he went to jail. 11. In Timeless, Lucy and Wyatt both confessed that they were saved by the other during the lowest moments in their lives. Also, let's not forget the memorable pool scene, even if it was cut for time. 12. In Legends of Tomorrow, Sara gave Ava her perfect first kiss when the duo was stuck as teenagers at a summer camp. 13. In Wynonna Earp, while Waverly and Nicole had some big milestones in 2018, nothing left us with a bigger smile on our faces than their "sorry party." 14. In Outlander, Jamie gave Claire a new wedding ring in one of the sexiest scenes of the series. 15. After seasons of will-they-or-won't-they, Liza and Charles hooked up in this season of Younger. 16. In Riverdale, Jughead told Betty that they are partners from now on — he also put his signature beanie on her, so it's true love. 17. Also in Riverdale, Archie told Veronica that he loved her and wasn't going anywhere. 18. After seasons apart, Mickey and Ian finally reunited as cellmates when Ian was sent to prison in Shameless. 19. Simmons delivered these heartbreaking and beautiful vows to Fitz on their wedding day in Agents of S.H.I.E.L.D. 20. In Shadowhunters, Jace told Clary everything he loves about her and it was adorable. 21. In Riverdale, Alice heartbreakingly revealed to FP that the son she gave up for adoption in high school was actually his. 22. In Elite, Omar confessed his love for Ander after Ander was beaten up and left for dead. 23. In One Day at a Time, Syd performed an adorable song and dance when she asked Elena to go to the school dance with her. 24. In The Bold Type, after a season apart, Richard surprised Sutton in Paris and wanted to give their relationship another try. 25. Also on The Bold Type, Kat and Adena took a major step in their relationship when they said "I love you" for the first time. 26. In NCIS: Los Angeles, Deeks told Kensi that he wanted to marry her and spend the rest of his life making her happy. 27. So they aren't an ~official~ couple, but the sexual tension between Eve and Villanelle in Killing Eve was enough to hold us over until 2019. 28. In Outlander, Roger serenaded Brianna when they attended the Scottish festival. 29. Somehow in all the heartache in The Handmaid's Tale, June and Nick managed to have this perfect moment with their daughter. 30. 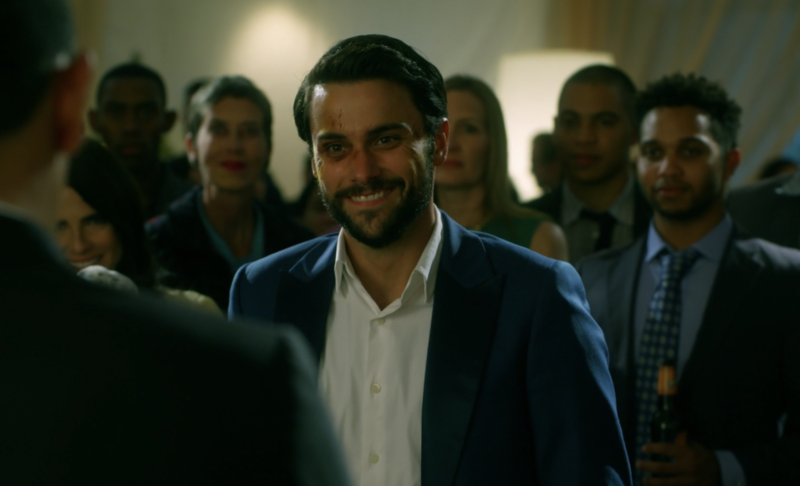 In How to Get Away With Murder, Oliver serenaded Connor with a perfect rendition of "All of Me" at their wedding. 31. And finally, Hook and Emma got their happy ending with their daughter in the Once Upon a Time series finale. What were your favorite TV couple moments this year? Tell us in the comment below!